DNB Cardiology is usually a 3-year undergraduate program, the least eligibility criteria are MBBS, completed a one-year internship and passed CET will be registered for DNB training in Broad Specialties. Admission into the Diplomate National Board of DNB in Cardiology relies upon the aspirant’s performance in the relevant entrance test and a counseling round. An average fee for the DNB Cardiology program in India ranges between INR 5,000 to 10 Lacs, for the duration of three years. Cardiology is a medical specialty dealing with disorders of the heart (especially the human heart). The main thing that is done during the program is diagnosis and treatment of congenital heart defects, coronary artery ailment, heart failure, valvular heart ailment, and electrophysiology. Aspirants also have the option of teaching at both private and government places along with their self-running hospitals. They can also become teacher/ lecturer on a private basis and after passing the UGC-NET exam can go for a permanent lecturer in colleges/ universities in the country. Applicants can seek a career in public and in private sector as well. They can be employed as doctors in hospitals or lecturers in medical colleges. Such aspirants are hired as Cardiologist, Junior Resident (Cardiology), Senior Resistant (Cardiology), Technical Assistant, Area Sales Manager, Consultant, Cardiology Manager, Lecturer/Professor, House Officer/RMO, Part-time Specialist etc. 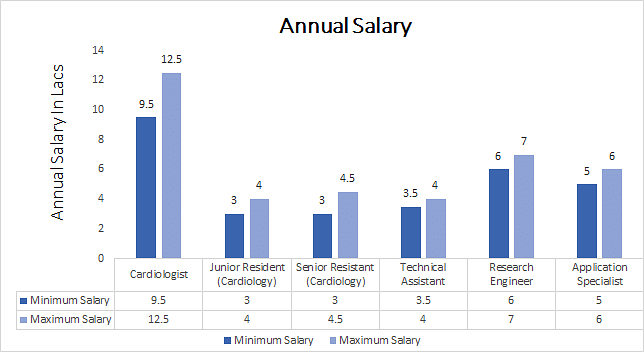 The average salary of Cardiology can be in the range of INR 6 to 30 lacs per annum. Given below are few of the important highlights of the program. Top Recruiting Companies Manipal, Max Healthcare, Metro Hospital, Kailash Hospital, Hindustan, Integro, Nextgen, Apollo, etc. Top Job Areas Hospitals, Defence Health Services, Schools, Colleges & Universities (Medical), Self-employment, Content Writing (Science) and such. Top Job Positions Cardiologist, Junior Resident (Cardiology), Senior Resistant (Cardiology), Technical Assistant, Area Sales Manager, Consultant, Cardiology Manager, Lecturer/Professor, House Officer/RMO, Part-time Specialist etc. DNB Cardiology: What is it all about? DNB Cardiology course incorporates an advanced investigation of the complexities of cardiothoracic surgery. Despite the fact that the cardiovascular framework is inseparably connected to blood, this program is moderately unconcerned with hematology and its diseases. DNB Cardiology covers most recent advances in cardiology mind, evaluation of new interventional as well as medicinal heart failure treatments, review of the most continuous hazardous distresses that can be analyzed utilizing electrocardiography, ordinarily misdiagnosed afflictions and specialization in treating heart illnesses utilizing catheterization. It additionally has the investigation of heartsickness side effects, for example, thrombosis as well as thermogenesis. DNB Cardiology program instructs creature thinks about, to delineate treatment strategy and impacts, impacts of radiation on the human body, perpetual indications and the effects of radiation on the body, radiation wellbeing for the two patients and staff in atomic drug and regulatory, natural and legitimate parts of the medicinal utilization of radiation. DNB Cardiology experts perform methodology, for example, cardiovascular catheterization, expand angioplasty, as well as heart surgery. The program is the best fit for the candidates who have incredible abilities in successfully speaking with the patients, family and the network. Candidates who need to become an expert in Cardiology and take the research further for inventive purposes additionally can go for this program. They ought to have great correspondence, relational abilities and scientific bent of mind. DNB Cardiology students ought to have the capacity to comprehend their qualities and shortcoming; capacity to function as an individual and as a feature of a group. Mentioned below are some colleges in India that offer the program. Given below is the minimum requirement of eligibility which aspirants are interested in pursuing the program. Applicants are required to fulfill the requirement, to be eligible to apply for the program. Only those applicants who have successfully passed MBBS, and completed the one-year internship and passed CET will be registered for DNB training in Broad Specialties. Some of the very reputed universities and institutes conduct entrance examination to get admission to DNB Cardiology degree program. For admission to DNB Cardiology program, an aspirant must fulfill the common eligibility criteria as mentioned above. Admission into regular DNB program is usually done by a common entrance exam directed by respective college. Application procedure for DNB entrance exam basically starts from May and June. Aspirants have to apply to respective colleges in both offline and online modes. A Year- wise syllabus for the program is specified below. Because of the constant increase in heart disease cases, the requirement for all the more super specialty heart care clinics is expanding alongside career opportunities for talented cardiologists in the nation. Talented heart medicinal services experts are required in both government and private healing facilities. Besides working in as honing specialists, cardiologists can likewise function as Lecturers in medical universities. Cardiologists are working in the hospitals on any of weekly, hourly and month to month premise. They can also open their own particular health care centers, or work in the research areas in the perceived hospitals. They function as specialists in the cardiology departments in cardiology divisions, cardiac rehabilitation centers, and defense hospitals, or can become scientist and researchers in cardiology.